You get different brands of toners from the market. But using store-bought toners regularly on your hair can cause damage to your hair. An effective solution for this is to make your own toner solutions at home. 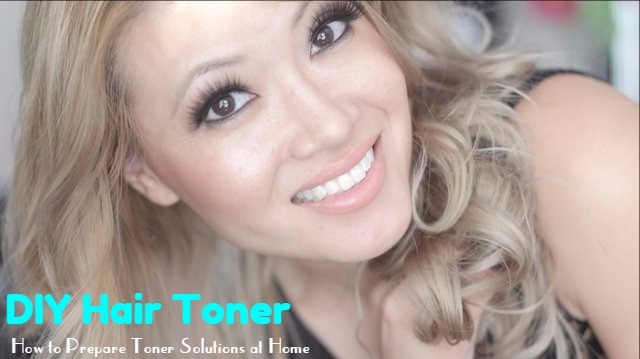 Here is how you can make toner solutions at home. Hair toner helps in removing the orange and yellow tones from your hair. Usually people who want to try out cool toned hair colours like gray, platinum or blue, use toners. They are also used when people want to attain colours like ash blonde and ash brown. How a toner removes unwanted red tones? People with dark hair have warm natural pigments, while those with light hair pick up warm yellow tones when they regularly use sulphate shampoos, and because of the mineral deposits from water and product build up. A toner helps in removing these pigments. If your hair is light blonde and it is picking up yellow tones, all you have do is to tone your hair. This removes the product and mineral deposits. How to Make Hair Toner at Home? To dye your hair, you have to follow the instructions give on the packet. Mix the dye in a plastic bowl. After mixing it properly, apply the dye on your hair. Leave it for the time that is specified on the box. Usually it is 30 minutes. Wash your hair with sulphate free shampoo fooled with conditioner. You need to do this only once. Ash-toned box dyes are very effective for getting rid of yellow/orange tones. This they do by neutralising the warm tones with cool ones. Take a jug and add apple cider vinegar. Dilute it with water. Now pour the mixture through your hair and wait for about 15 minutes. Rinse your hair with lukewarm water. Apple cider vinegar can dry your hair. So, do not use it more than 3 times a month. Take a jug and ad all the ingredients in it. Combine them well with little water and keep it. Now rinse your hair. After rinsing your hair with water, use the shampoo mixture you have prepared to wash your hair. Leave it on your hair for about 5 to 10 minutes and then wash it off with water. Follow this with conditioner. You may add one or two drops of food colour to your conditioner for extra toning. Use this shampoo mixture only once in a week. Otherwise it may dry your hair. On other days of the week you may use sulphate free shampoo to which a few drops of purple and blue food colour are added. Boil the ingredients till you get thick liquid. Keep it aside to cool down. Once the mixture is cooled, apply it on your hair. Leave it on your hair for 10 minutes and then you can wash it off with lukewarm/cool water and sulphate free shampoo. You can use this toner on your hair once a week. Add the ingredients into a spray bottle and shake the bottle well so that all the ingredients mix well. Spray this honey-lemon mixture onto your hair. Take care not to saturate your scalp with this mixture. Leave this on your hair for 2 hours. Try to spend 30 minutes of these 2 hours outside in the sun. Now use sulphate free shampoo and rinse off the mixture form your hair. Follow it with conditioner. Use this mixture on your hair only 3 times a month. Take a bowl and mix the ingredients well till you get a lavender mixture. Apply this on parts of your hair that need toning. Wait for about 30 minutes and then wash it off with sulphate free shampoo. You can repeat this every time you see that your hair is taking on yellow tones. Why Opt for DIY Hair Toner Solutions? These toning solutions are very effective for getting rid of yellow tones. This way you can save money that you may have to spend by going to the salon and treating your hair. However, these toning solutions are not likely to get rid of strong orange tones. For this you will have to get the help of a professional. By bringing in subtle changes in your hair care regimen like using a sulphate free shampoo and regularly using clarifying treatments can help in keeping the warm tones out of our hair in the long run. Most of these treatments, except No. 5, are free from chemicals that may harm your hair. You will have to work for a bit and sped some time to keep the warm tones out of your hair. But the wonderful result that you get at the end of the day is worth all the efforts you have taken.